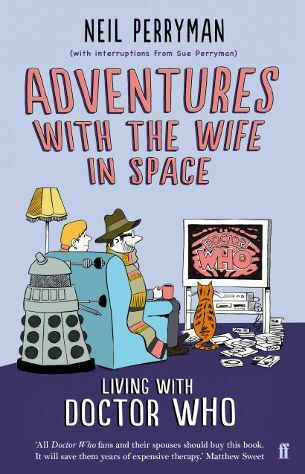 Adventures With The Wife In Space book review . Back in 2011, Doctor Who fan Neil Perryman set himself a daunting challenge: to watch every episode of the classic series, in order – even fan reconstructions of the ones which no longer exist - and blog about the results. And, most significantly, to do it in the company of his sceptical “not-we” wife, Sue. It took over two years, and the results were often hilarious and sometimes genuinely insightful, with Sue, blissfully ignorant of fandom’s sacred cows, voicing questions only an outsider would think of and trashing supposed classics like a true iconoclast. Perryman’s book (subtitle: Living With Doctor Who ) is not a hard copy of the blog (although there are brief snippets, with Sue’s voice breaking in to bluntly undercut Neil’s more reverent tone). Instead it takes a more personal approach, starting off as an account of one fan’s love affair with the series (including periods of infidelity and estrangement) - the sort of thing any lifelong fan of a certain age will strongly identify with. Then it moves on to discuss “the project”. At the back are appendices breaking down’s Sue’s rating scores, plus a special treat: a bonus write-up on “The Name Of The Doctor”. There’s one problem here, which is that the “fan memoir” thing has already been done – journalist Nick Griffiths got there first, with 2008’s Dalek I Loved You . But Perryman’s account is wittier and more barbed. It also includes some priceless anecdotes: how “The Green Death” gave the young Neil a terror of flying ants; the playground game which involved two girls pretending to be robotic mummies crushing him to death with their chests (why didn’t we think of that? ); the time Colin Baker denounced Neil as “a parasite” from a convention stage, due to a cheap sizeist gag in a fanzine. It’s also surprisingly moving. The book is at its best when it touches upon Neil and Sue’s relationship, which has, thankfully, been strengthened by their marathon viewing rather than as might have seemed more likely…) wrecked by it. If you’ve already read the blog, and feel like you’ve got to know the couple a little, this material will feel particularly sweet. If you haven’t read the blog, go and do so immediately , from beginning to end. Once you’re done, you’ll probably conclude that buying the book is the very least you can do to say thank you for half a million words of free entertainment.